The Kick It Forward Foundation is a tax exempt nonprofit association under IRS code that helps to build the self-esteem of bullied and/or disadvantaged persons, provide them with a safe & inclusive environment for personal development, and empower them with quiet confidence, primarily by facilitating participation in martial arts. UPDATE: The event is over for this year. Hope you'll continue to support the Foundation in 2018! 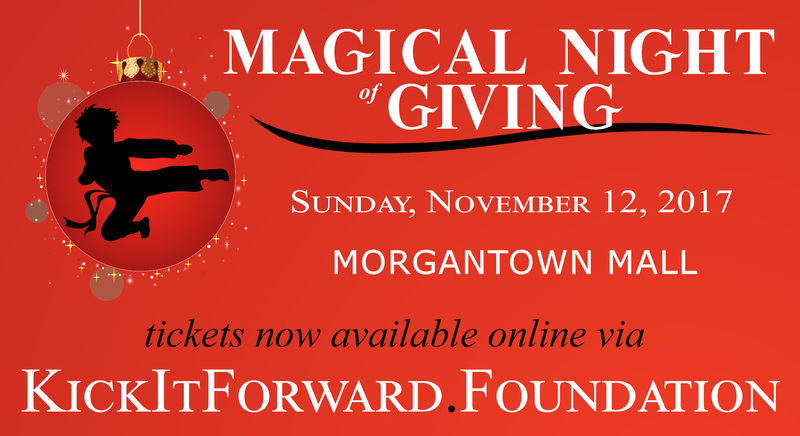 The Kick It Forward Foundation is selling tickets to the annual Magical Night of Giving at the Morgantown Mall. 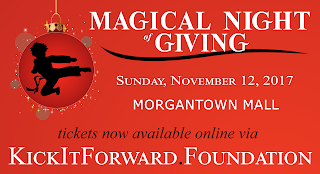 This year, it will be held on Sunday, November 12th from 6:00pm until 9:00pm. In addition to providing entry into the event, your ticket also enters you in the evening's many prize drawings, including THREE $1000 mall shopping sprees! You don't have to be present to win, either. The cost is $5 per ticket for up to 5 tickets per order. If you want more than 5 tickets, simply place an additional order. Your ticket(s) will be mailed to you. (A $0.50 charge is added for postage.) Additional donations are welcome (and tax deductible)! Copyright 2015, Kick It Forward Foundation (FEIN 47-2110456). Travel theme. Powered by Blogger.